Currently under construction at the Columbus Shipyard in Italy, the new 61 metre, steel-hulled superyacht Columbus 199 designed by Tommaso Spadolini is a new joint central agency with Bassam Chahine at Merle Wood & Associates and Mohammed Chehab at Lebanon-based brokers, Chehab Marine. 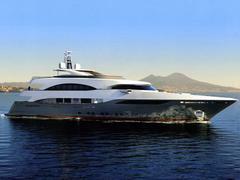 Delivery of the Columbus 199 is scheduled for 2012. “The metal has been cut and this is a critical part of the process,” continues Bassam. “The hull should be completed in about six months and I can see the engines being installed in around 12 months time,” he adds. The asking price is €32.5 million. Another new build available through the same team and from the same yard is a 53.7m Columbus 177, asking €24.95 million and due in 2010.